While a small number of video games have been based entirely around Christmas, several others offer their taste of the festive season in smaller portions. Some of these are sincere, cute, and appropriate for the holidays … but others are suitably in-tone with the darker, weirder content found elsewhere in the game. Sure, they may not always feel relevant, but the unconventional Christmas levels explored below are an absolute delight to play through nonetheless. They add a fun, colourful dimension to their respective title, and give you good reason to dig older games out for the Xmas season once a year. In some cases, the developers seem to have gotten as much joy out of making their Christmassy content as we do playing it! Saints Row IV pulls no punches when it comes to lunacy, and this is perhaps most true of its How the Saints Save Christmas DLC. Featuring three unique parts – Miracle on 3rd Street, The Fight Before Christmas, and The Santa Clawz – this package is a great little adventure to try at Christmas. You’ll get to take on the nasty Santa Clawz, his army of Gingerbread Men, and help the true Santa deliver presents. It’s pretty crazy stuff, and only gets more so as the DLC goes on, until you’re soaring through the skies in Sleigh One, taking enemies out while dropping gifts. There are some nice references to such disparate Christmas classics as Die Hard, A Christmas Story, Love Actually, and How the Grinch Stole Christmas too. 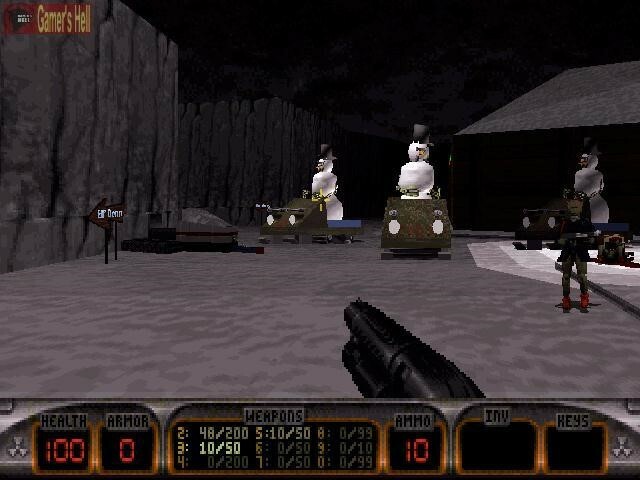 Christmas isn’t the first thing you associate with Duke Nukem 3D, but the season of goodwill gave the iconic hero a memorable expansion pack nonetheless. In this release from December 1997, Duke is tasked with rescuing Santa Claus from the nefarious aliens Duke fought previously, before they use him to take over the world. New locations to be explored and shot-up in Nuclear Winter include Santa Claus’s HQ, a toy factory, and more. Snowmen, elves, Christmassy Pig Cops, and even Santa himself (retitled Santa Claws) feature as enemies. It’s all pretty aged now, like the bulk of Duke games, but Nuclear Winter is still a nice festive addition to a classic title. 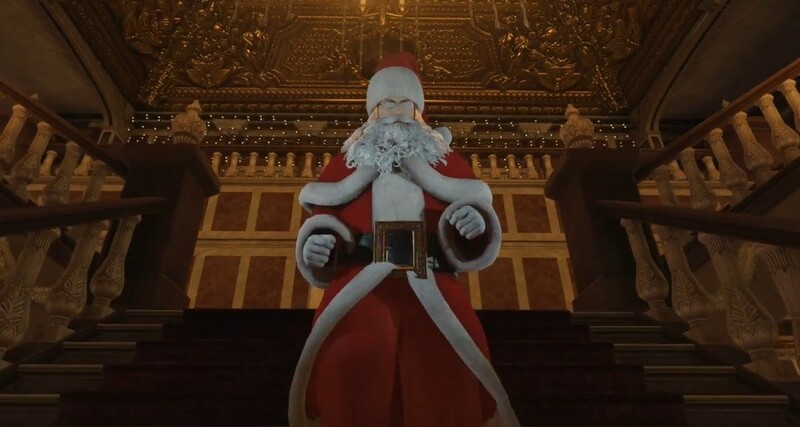 There isn’t too much peace on Earth in the Hitman series, but it’s covered Christmas more than once during its long history, notably in its ‘You Better Watch Out’ and ‘Holiday Hoarders’ missions. The latter was released in December 2016 in support of the World Cancer Research Fund, and it sends 47 on the trail of two thieves based on Harry and Marv from Home Alone. You get to dress up in a nifty Santa outfit (complete with little round glasses), and take on Harry and Marv in a way that Kevin McCallister never did. You can waste the targets using methods that look like accidents, toast them with an exploding propane tank, or however else you like. Top stuff. There’s been plenty of debate surrounding Die Hard in recent years, which cuts to its very heart and soul: is it a Christmas movie or not? Well, we all have our own opinions. To some of us, Die Hard is as much a Christmas flick as, say, It’s a Wonderful Life and Scrooged, being essential viewing every Yuletide season. To others, it’s an action film that just happens to be set at Christmas, lacking the warmth, charm, and uplifting vibes expected of traditional festive fare. Still, there’s no denying that the movie does include its share of Christmassy touches, and these appear in the 1996 adaptation of the first three (and best) Die Hard films too. 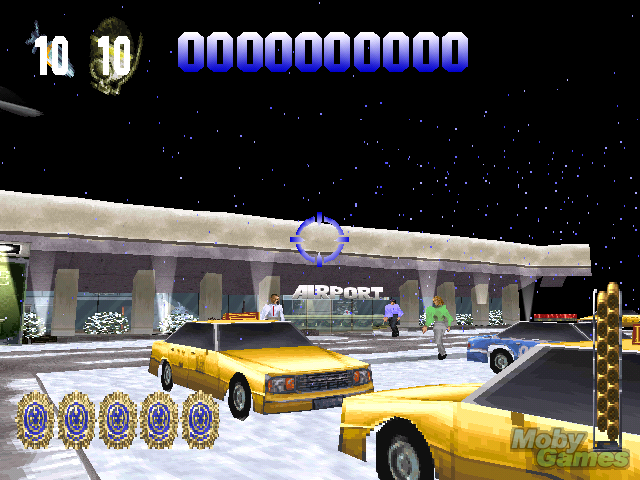 At times in the game based on Die Hard itself, you’ll steer McClane past numerous Christmassy decorations, but it’s probably the first stage in the Die Hard II: Die Harder adaptation that feels most in-tune with the season. Okay, so it features shooting and explosions and reports of “firing in the terminal”, but hey – there’s plenty of Christmas in the background to enjoy. Pay attention to the tinkling bells in the score, the snow on the ground, and the Christmas trees adorning the airport: despite the limited hardware and aged visuals, it still captures the more Christmassy aspects of the movie it’s based on. Beyond this, it still makes for a terrific opening level to a fantastic arcade-shooter. 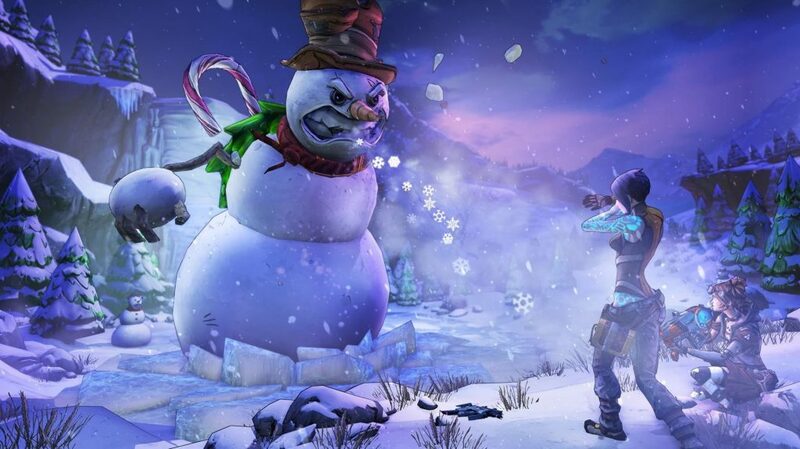 This Headhunter pack brings a touch of Christmassy action to Borderlands 2, and puts you into some gorgeous wintery locations. The graphics look terrific with falling snow and so much crisp whiteness, while you get to face Abominable Yetis, tough snowmen, and other memorable enemies. Marcus’s recent gun shipment has vanished, and he wants it back. Venturing into the town of Gingerton, you have to take down Mister Tinder Snowflake and his army, exploring the gorgeous environments as you go. You can even stop and watch a sinister musical performance, if you so wish. At times, this feels pretty ghoulish and reminiscent of The Nightmare before Christmas, though it’s obviously fairly different. It’s a good choice for when you want to delve into something silly, fun, and seasonal (alongside our earlier Saints Row IV pick). 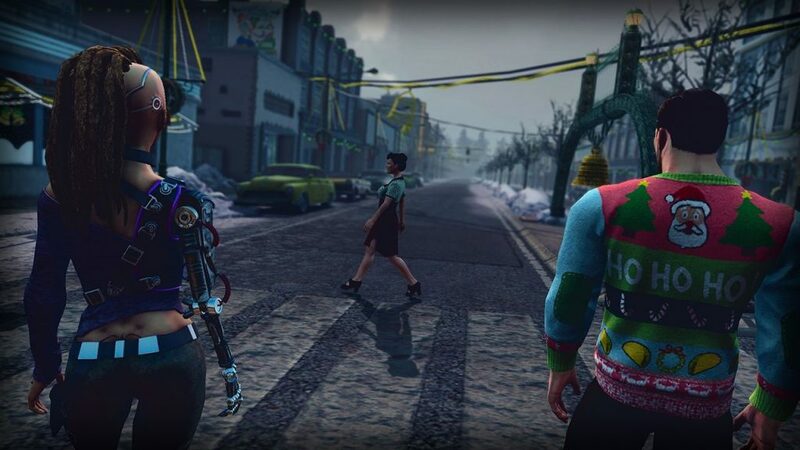 What are your favourite Christmas levels in non-Christmassy video games? Let us know!